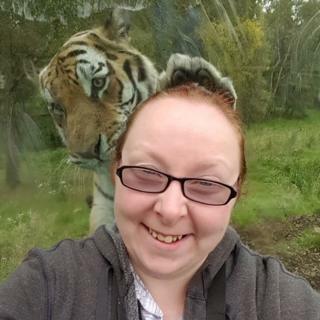 A visitor to a Scottish animal park captured a perfectly-timed selfie with a large male Amur tiger. Donna Martin took her image at the Highland Wildlife Park at Kincraig, as tiger Marty put a paw on a pane of protective glass behind her. Marty is one of two Amur tigers held in the collection at the Royal Zoological Society of Scotland's park in the Cairngorms near Aviemore. Ms Martin let the park's staff know of her close encounter with the big cat.